One of the most unique shops at the Wizarding World of Harry Potter is Honeydukes Candy Shop. This is the largest store at the Wizarding World of Harry Potter and contains candy right out of the pages of the Harry Potter books and from the movies as well. Honeydukes contains aisles of candy and is a MUST DO for anyone visiting Hogsmeade! Just walking through this colorful shop is a sensory experience in itself! Some of the more popular candy items at Honeydukes include Bertie Bott’s Every Flavour Beans, Pumpkin Juice in a commemorative bottle and Chocolate Frogs complete with a wizard trading card! Even the candy packaging at Honeydukes is authentic to the Harry Potter books and movies. Each Chocolate Frog contains 1 of 4 wizard trading cards featuring either: Gryffindor, Ravenclaw, Hufflepuff, or Slytherin. Can you collect all 4? Chocolate Frogs cost $9.95 each. The Every Flavour Beans cost $10.95 and contain all kinds of common and unique flavors. Earthworm and earwax are just a couple of the more unique flavors you’ll find. When entering the Wizarding World of Harry Potter from the Lost Continent, Honeydukes Candy Shop can be found on the left side of the street, right after you’ve walked past the Hogwarts Express locomotive. Honeydukes is also adjacent to Zonko’s Joke Shop so you can walk between the 2 from the inside! 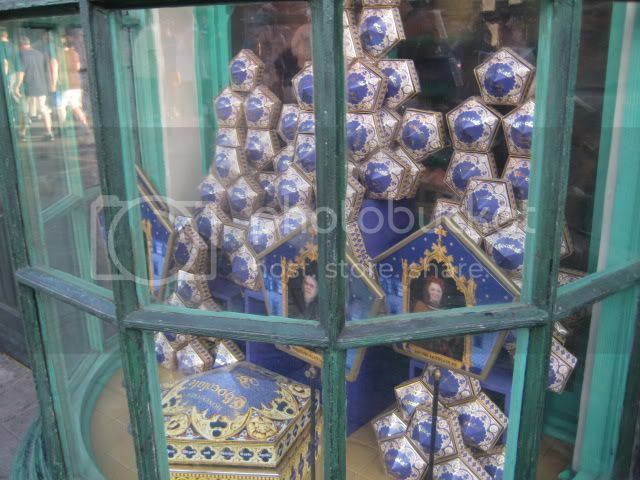 Be sure to check out the amazing windows at Honeydukes as well–one of the best things to see at the Wizarding World of Harry Potter!